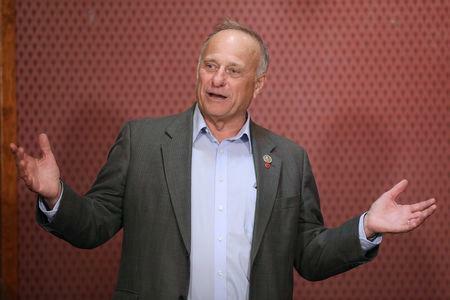 (Reuters) - U.S. Representative Steve King, an Iowa Republican, won re-election late Tuesday despite publicly losing a corporate supporter shortly before Election Day and being criticized by some within his own party for inflammatory remarks on immigration and race. Just days before the Nov. 6 elections, agricultural dairy cooperative Land O'Lakes pulled its support for King, saying it sought to "ensure that recipients of our contributions uphold our company's values." Though heavily criticized, King, 69, held off a challenge by Democrat J.D. Scholten, who raised more money than King had. He beat Scholten by 3 percentage points and was elected to a ninth term for Iowa's large and mostly rural 4th district. King has been criticized by members of his own party for comments and support for candidates with white supremacist affiliations. Last month, King tweeted a photo of multiple breeds of dogs, noting "all the diversity" at his annual pheasant hunt. King has a long track record of remarks decried as racist, but the comments came under renewed scrutiny after a massacre at a Pittsburgh synagogue in late October. In the attack, believed to be the deadliest on American Jews, a gunman who yelling “All Jews must die” stormed the Tree of Life synagogue in Pittsburgh and killed 11 people. The suspect has pleaded not guilty in a federal court. During a recent trip to Europe financed by a Holocaust memorial group, King met with officials from an Austrian far-right party with ties to neo-Nazi groups after touring Holocaust sites, according to the Washington Post and other media outlets. After the Pittsburgh shooting, King told the Washington Post he was not anti-Semitic. He also retweeted a Twitter post quoting the late Pope John Paul II saying that Jews are "dearly beloved brothers."